Any updates on the timeframe of when you will include the ability to mass upload an individual wholesale (using your wholesale pricing module) price for each product? 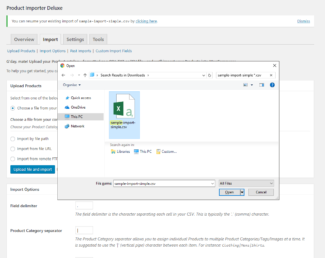 Michael, are custom fields suppose to update during a “merge” CSV upload? They fail to update for me. The only solution I have is to delete the items and then re-upload. That would be great Michael, we are working with over 2,000 items and updating custom fields, categories, and images is crucial for our growth. Note, we are having issues updating images as well. 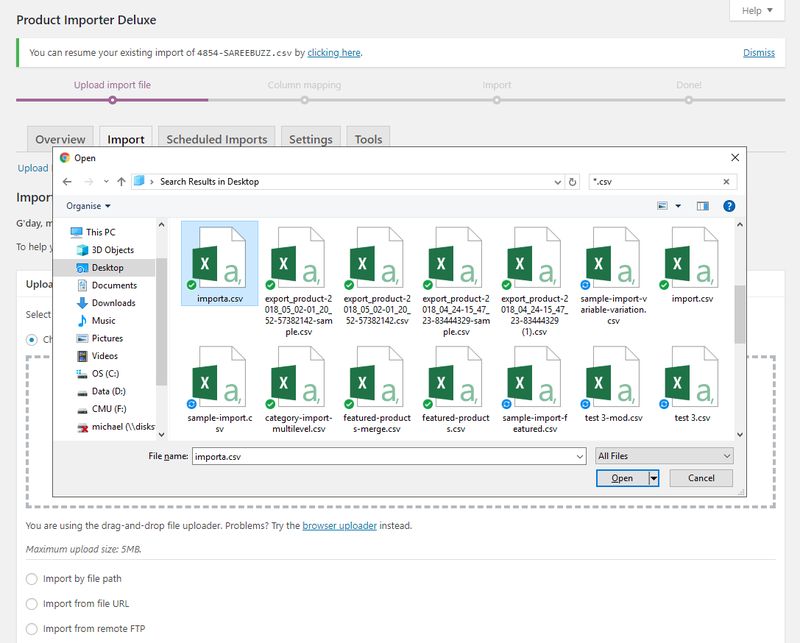 How do I assign product variations in this import? 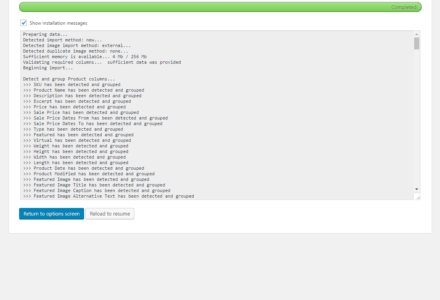 Hey Michael, is the admin for this supposed to be under Settings still (as per your screen grabs)? Can’t find it anywhere. 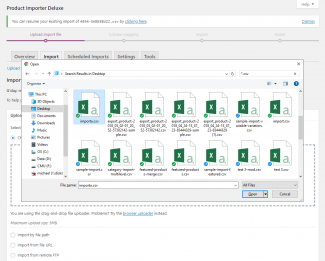 I have the latest version of WP and WPEC and v2.8.7 of the importer. Anyway, I found it and tried the import, got the success message but there’s no products. I checked in phpMyAdmin as well and there’s nothing. Pretty sure my spreadsheet is fine as I downloaded the sample one then modified it. Any ideas? Also, when importing (I think this may be the problem) it can’t seem to tell when the rows start and end. So when assigning columns it has all the header row data then all the other rows following, wanting to assign columns to them. As I said, I used your sample spreadsheet as a template so I don’t think I have any weird formatting in my spreadsheet. 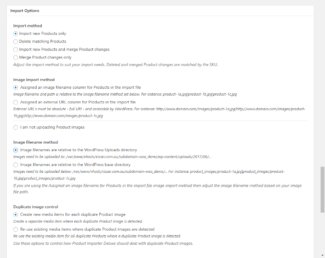 1. is this plugin supports wpml with e-commerce? that’s very good news indeed. But what about more than 10 language? hey michael, can you give e a target date for next release of update with WPML support? my customer asks me every day to update their website but i am waiting for the WPML support before i do.. I did my first product import last night. Some of the photos were not linked correctly and I had to upload new photos. I made some corrections to the CSV and re-imported however this time it will not link or update photos, it is completely ignoring them. 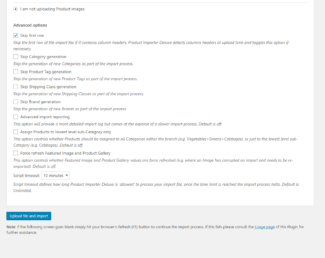 How do I get this to import and link the product photos? 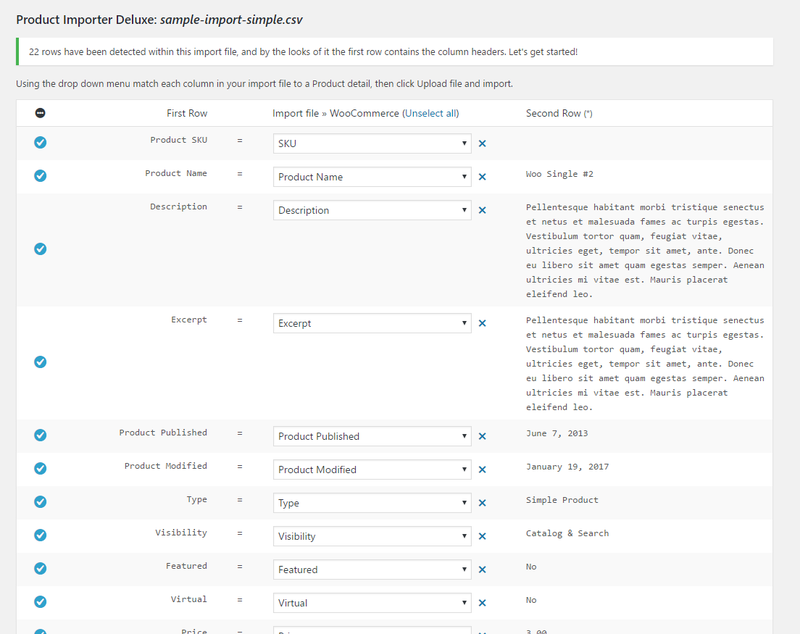 I am selecting the option for image column in CSV on import and also the merge with existing product data option. I have followed the instructions in the readme.txt. What I am doing is exporting current products that don’t have photos (as CSV) and then adding the image column and importing using the above options. I have tried to save my CSV file as a new file. I noticed there was an update to the plug in today and installed it. Still no photos on import. I have had the same scenario as Sarah, but I have worked around by re-uploading the images. After re-uploading the images they reconnected to the items. 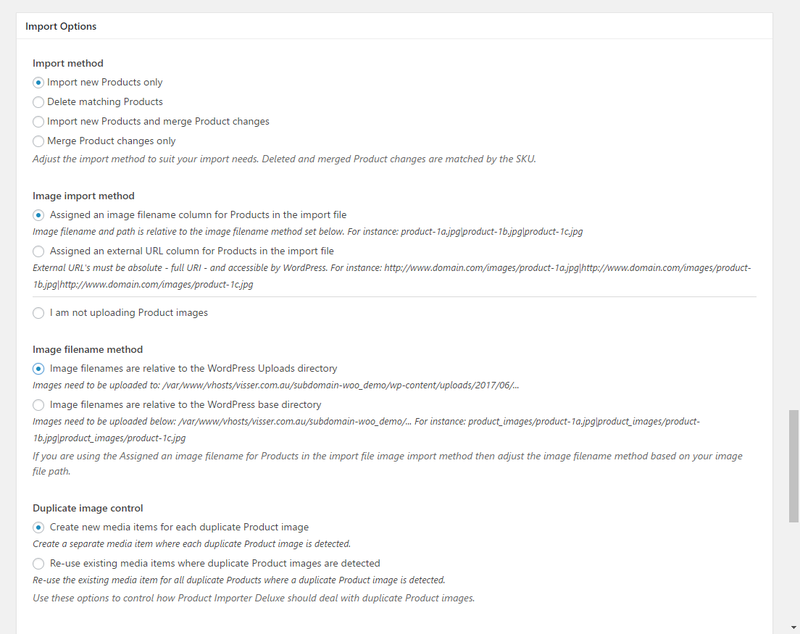 When uploading items and merging new changes, I can’t get images to update, i.e. 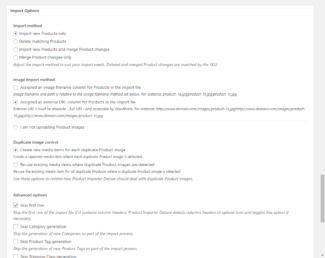 if I want to use a new image, I would change the image name in the CSV and upload the image, however the image doesn’t get updated. Any idea what I am doing wrong? 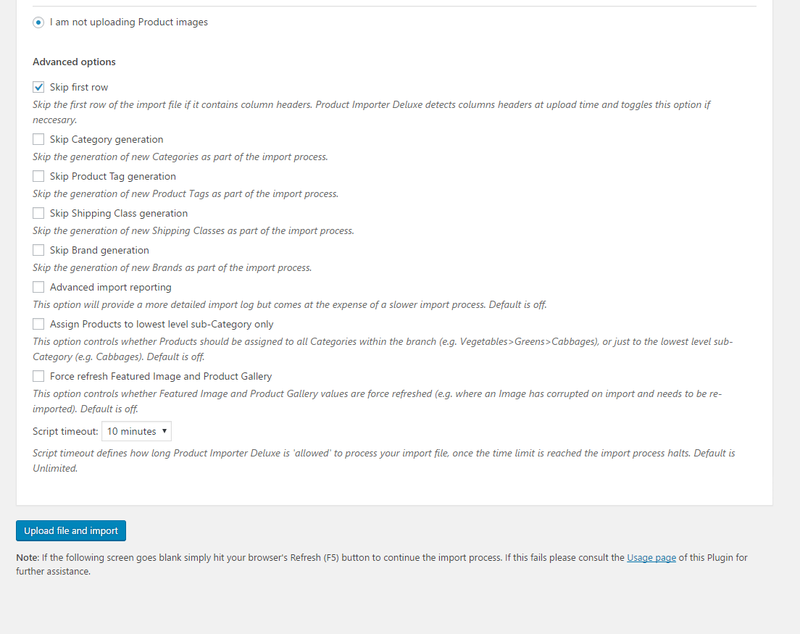 Similarly, I can’t get the “Category” to update with new data when doing an upload of pre-existing products. 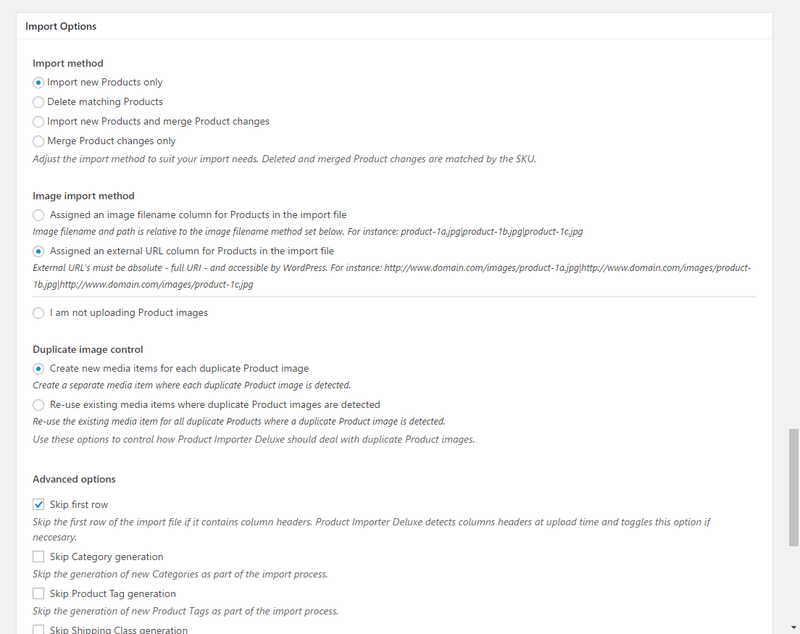 If it turns out that I can’t update categories during a merge, perhaps I could upload more than one category during the initial item upload. Ultimately, I want the same item in two different categories, i.e. a brand page and a category page. oh… one more question, sorry…. can it import from many spreadsheets? 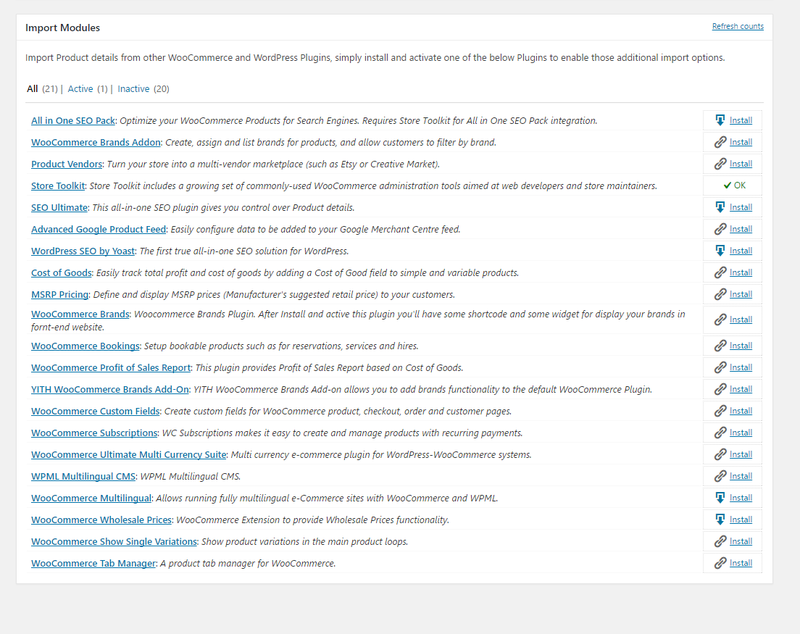 i have several vendors and i keep them separate because they don’t all update at the same time…. cool. makes sense. and… does it export? 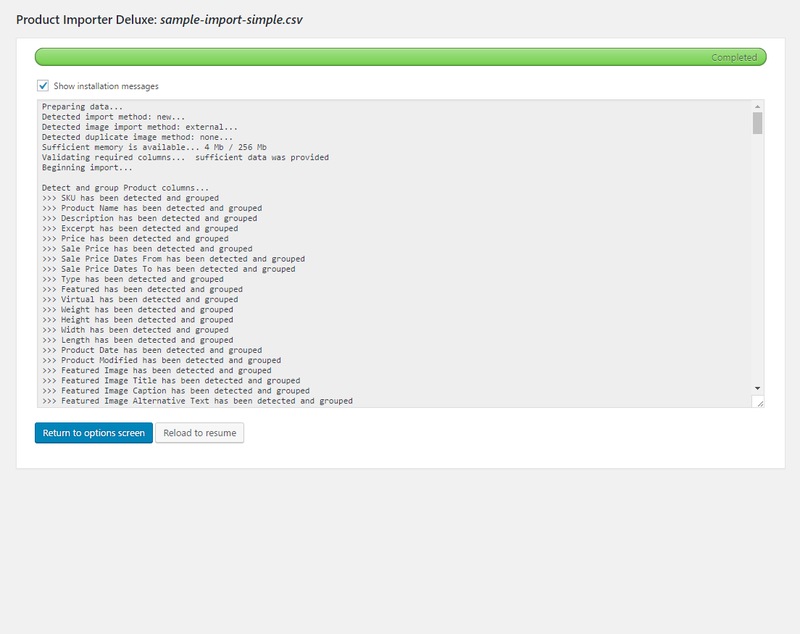 You can use my Exporter Plugin to generate a detailed CSV. 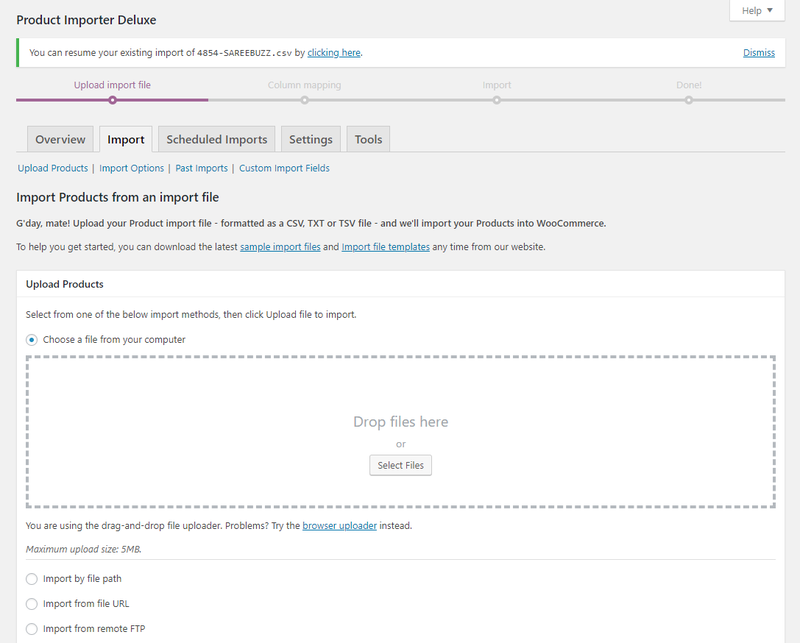 It’s an early release so there might be a few kinks that need to be worked out/additional Product export details added. 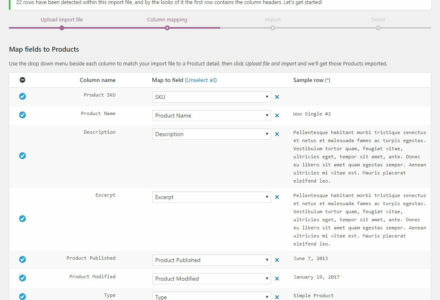 michael, where does that product exporter put the csv file? 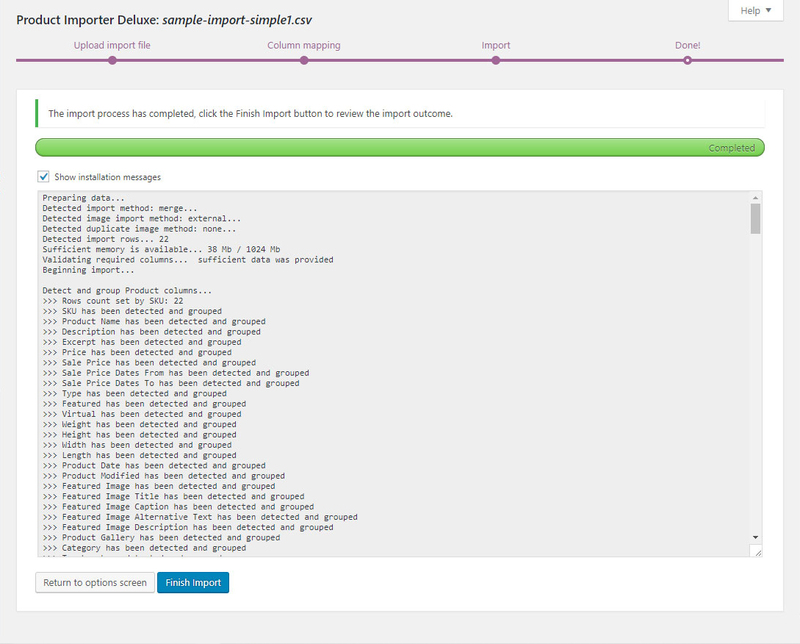 it says it exported successfully, but didn’t give me a filename or a path…. thanks. i think i wasn’t selecting products or categories the first few times i tried. now it seems to be doing its thing. thank you. 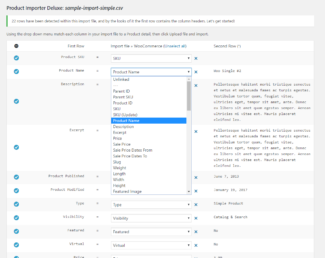 hi… wondering if the Product Importer Deluxe is able to import meta tag information for products? 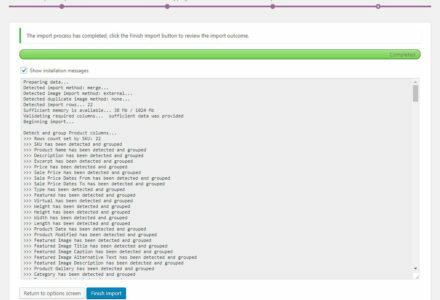 Hi fontaholic, by meta tag information do you mean integration with AIOSEO (All In One SEO) Plugin? I think it’s a great idea if so. Here’s an Idea to keep track of it. 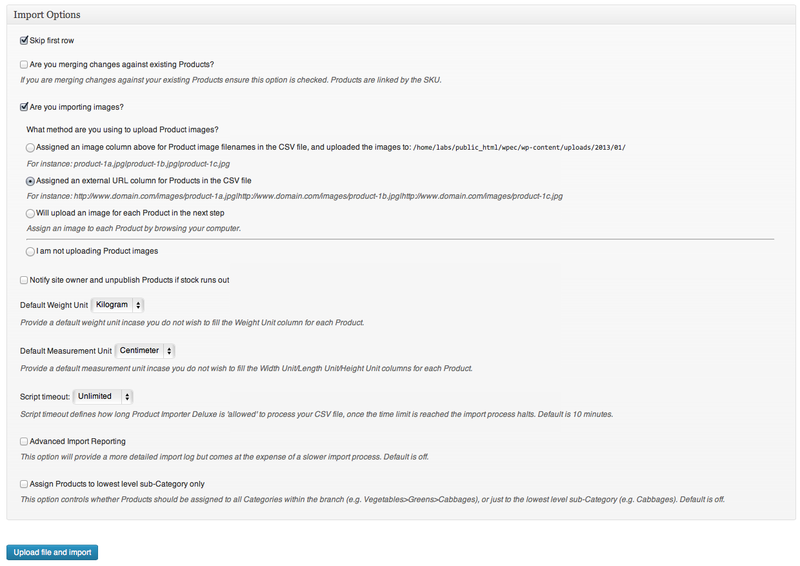 I posted in the forum about an issue I’m having with merging updates into existing products. Can you explain how it is supposed to work. Perhaps I am doing something wrong. Either way I have not been able to update my products. Hi Michael, thanks for offering AIOSEO pack integration. I am just looking for the sample spreadsheet you talk about. It appears the one listed at the top of the page is still for the older version. ok, so it looks like I’ve figured it out. Thought I’d post it here for anyone else wondering how to do it. It was one of those things that was so simple, it was assumed, but not particularly clear to me at first. 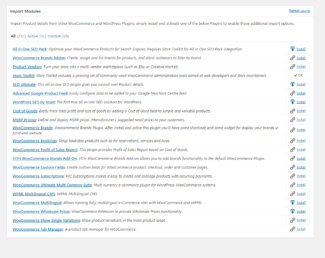 and you get to the page where you see your csv’s ‘first row’ entries in a vertical column on the left and then in the ‘CSV-> Wp e-commerce’ column next to that on the right, each variable has a drop box. I was confused (as you may be) because I couldn’t immediately see those options (you have to scroll each one down). 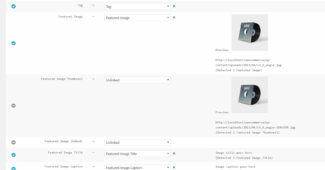 Also, in the past we’ve had to add these custom variables ourselves using the custom fields plugin. So I couldn’t work out what the titles needed to be in csv. These titles are what need to go in the first row of the csv file and their corresponding values in the csv column beneath. 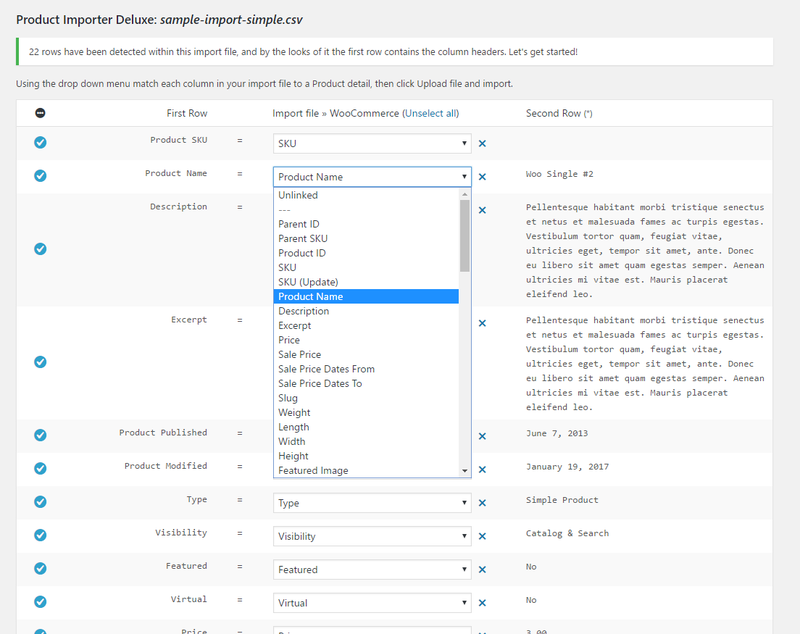 All you need to do on import is SCROLL DOWN in these CSV -> WP ecommerce drop box options, then select the title that matches the column in your csv on the left of it. Hope that helps someone. I was puzzled for days. Cheers. BLAH! Although I found the dropboxes, I still can’t get it to work. I did a csv import, but I see no data being entered into the AIOSEO boxes in a product listing in WP admin and also when I go into phpmyadmin in cpanel to see whether it’s been entered into the DB, it’s not appearing – at least I can’t find it. Can you please point me in the right direction. Thanks. getting closer…. 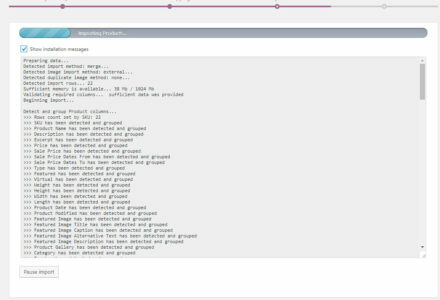 that time it worked if I have no commas, just a single word in the csv cell…. Ok… just so im clear. First, set up my cvs spreedsheet with all the categories and custom fields included. 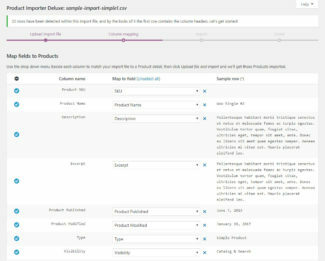 During the import… your “product importer” will not only create the products.. but will also create the categories and custom fields associated with those products. No need to create the categories/custom fields “before the import”? correct? So its probably a good idea to get rid of any existing categories/custom fields? So, If the custom fields are created “during the import”… im assuming… that “after the import” would be the time to go in and format the “type of custom field” (text box, pulldown, etc)? Hi Chuck, that’s mostly correct. 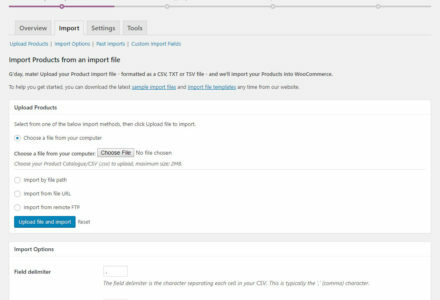 You will need to create the Custom Fields prior to the import as this is not yet supported. I like you idea of importing them as generic custom fields initially. 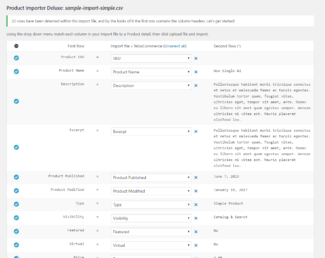 Anyway the product importer can do the opposite and export all my products? 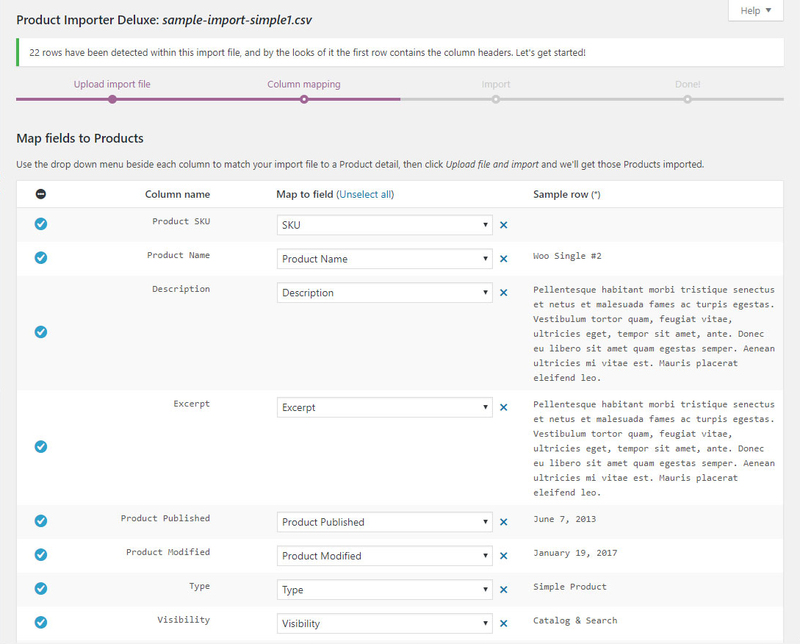 Also any updates on the ability to mass import individual wholesale prices per product when we are using the wholesale pricing plugin? 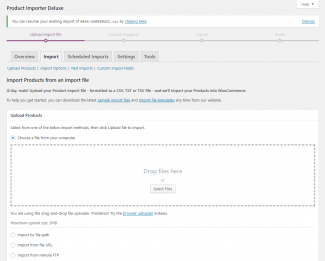 Does your importer work for WooCommerce? 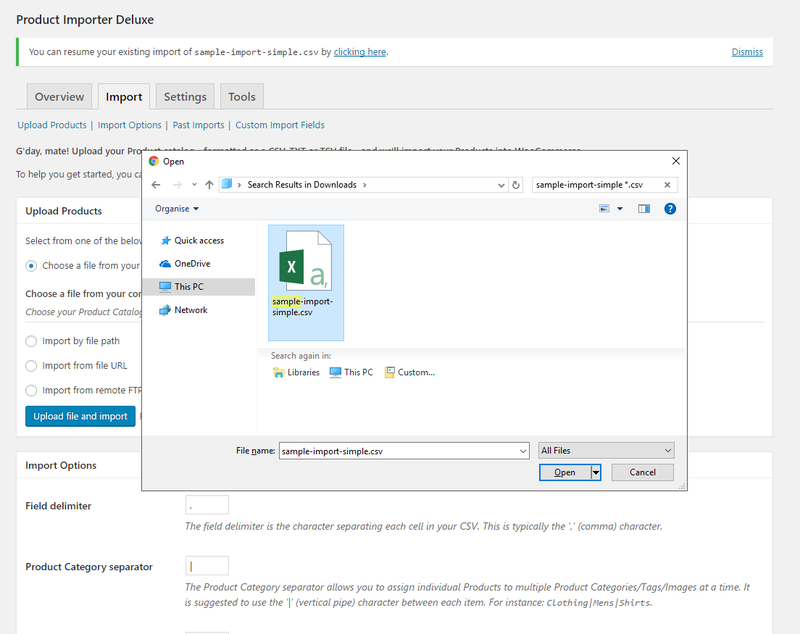 Have you seen anyone use your importer to switch from OScommerce to WP-ecommerce? That would be great! How do we go about that? 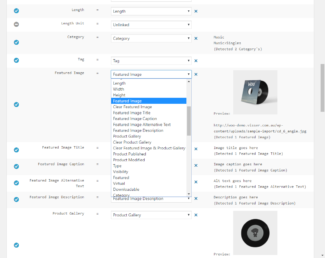 Product variations work great when adding a specific product to a page. 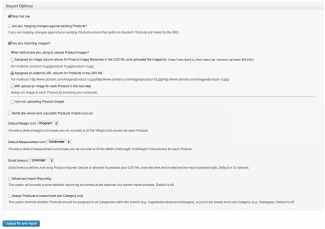 However: when adding a product category to a page they no work. any idea what could be the issue here? I have more than 250 products migrating from another store. 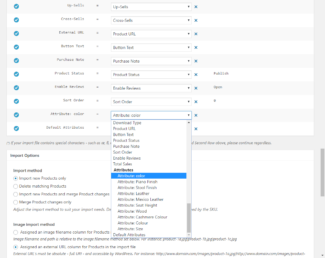 Each one of those products have custom fields. 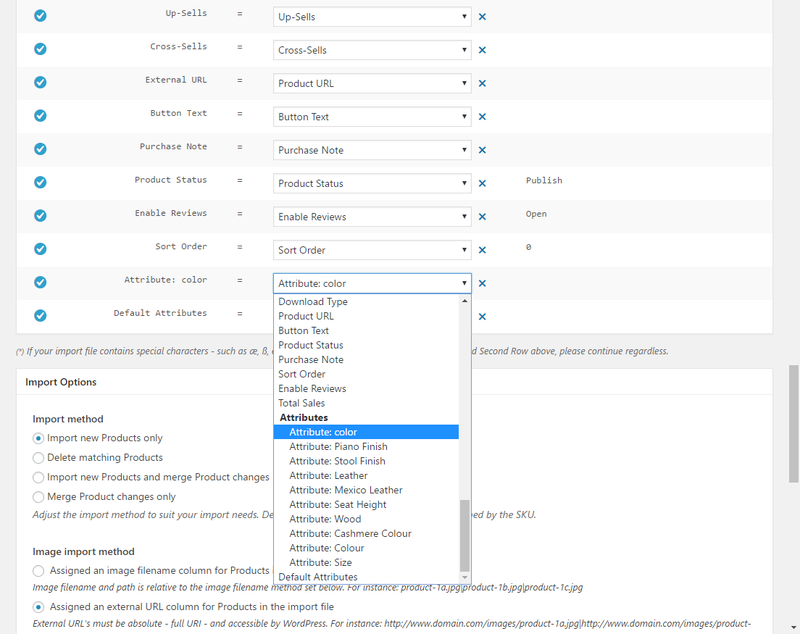 Question: Once my custom fields are set up with your “Custom Fields for WP e-Commerce product”…… Does “Product Importer Deluxe” populate those custom fields with the info from each product? 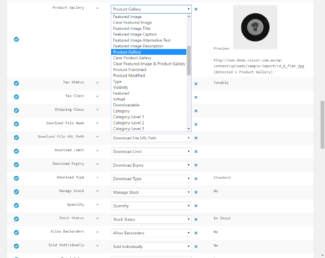 If not… I would have to go into each product.. and manually enter the info for each custom field??? ughh. 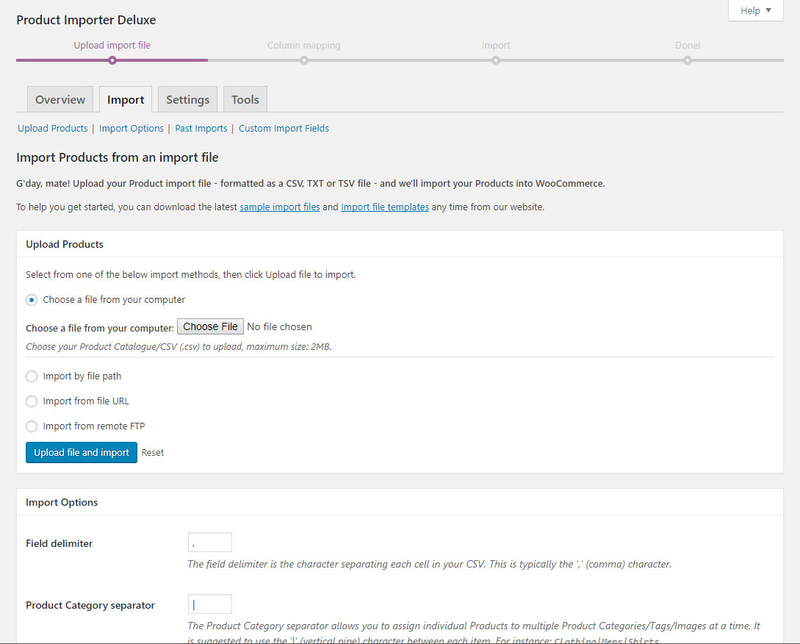 Hi Chuck, Custom Fields support is ready to go in Product Importer Deluxe. Just create an additional column in your CSV (e.g. Material or Classification) and populate that column just like the rest, Product Importer Deluxe will detect the Custom Field column and assign those details for you. I’ve made it as easy as possible to set up a new store in one hit. Let me know either way, I’m always around to help in case you have a question or suggestion.